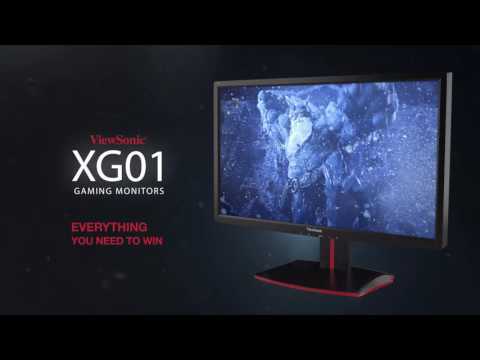 The ViewSonic XG2701 is a 27” Full HD monitor packed with all the speed and features that diehard gaming enthusiasts need. Featuring an incredible 144Hz refresh rate, as well as VESA Adaptive-Sync Technology, this monitor’s variable refresh rate capabilities virtually eliminate screen tearing and stuttering for fluid gameplay during fast-paced action scenes. A blazing-fast 1ms response time and low input lag provides smooth screen performance even in the most graphic-intense sequences. For optimum speed and performance, SmartSync technology automatically selects the best refresh rate and response time, and lowest input lag needed in FPS games. For a game-winning competitive edge, a Game Mode feature optimizes visuals for FPS, RTS and MOBA. On top of that, a black stabilization function helps you target enemies lurking in the dark, while the monitor maintains brilliantly rich colors and contrast. With a gamer-inspired ergonomic stand that features an integrated headphone hook and cable management functionality, the XG2701 has all you need to conquer your gaming and entertainment quests. Perfect for fast-paced racing and FPS gaming, the XG2701 gaming monitor blazes past competitors at 144 Hz per second – 2.4x faster than a conventional 60Hz display. This produces natural-looking, ultra smooth video with no motion blur. See through your opponent’s strategy with smooth movement, crisp edges and a clear picture at 144Hz. DisplayPort, HDMI, and integrated USB inputs enable users to connect to game consoles, Blu-ray players, digital cameras, laptops, satellite boxes, and other high-definition devices. In addition, the dual HDMI ports can also function as MHL ports for easy connectivity to mobile devices.